Adding a new contact to your iPhone is an effective way to make sure that you remember a phone number, or will have access to it in the future when you need it. You can then access that contact by searching for it with Siri or Spotlight Search, or browsing to it through the Phone or Contacts app, and you can add or update information about that contact as it changes. But you may find that you have created multiple contacts for the same person, or that your contact list has grown out of hand and you need to remove some of the lesser-used contacts from the iPhone. Fortunately you can delete any individual contact on your device if you have determined that you no longer wish to store their information as a contact. The steps in this tutorial are going to delete an entire contact from your iPhone. This includes their phone number as well as any additional information that you have added about them, such as an email address or street address. Note that this will not delete any existing message conversations that you have ongoing with them. Those conversations will remain, but will be replaced with their phone number or email address in the Messages app. 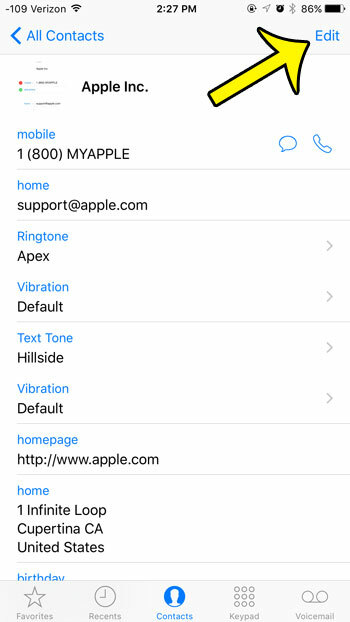 Select Contacts at the bottom of the screen, then select the contact that you want to delete from your iPhone. Scroll to the bottom of this screen, then tap the Delete Contact button. Tap the Delete Contact button again to confirm the removal of this contact from your device. Would you like to get rid of the “Sent from my iPhone” signature that appears on emails that you send from your device? You can remove the signature completely, or change it to something else.